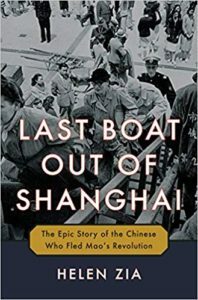 Bert Zipperer interviews Helen Zia about her new book, Last Boat Out of Shanghai, on Madison Wisconson’s WORT radio program. Listen on the WORT website. Robin Morgan interviews Helen Zia about her book and relevance to today’s events. Listen on the WMC website. 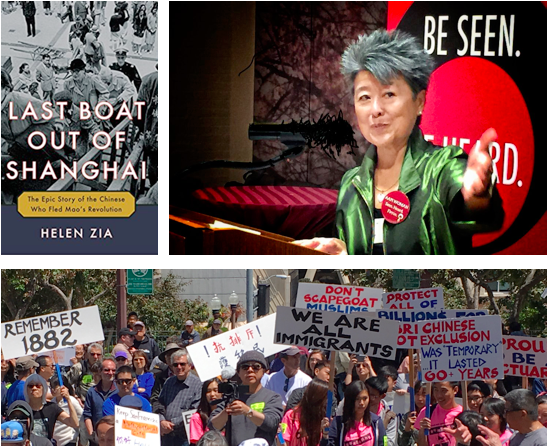 A very informative interview with Helen Zia about her new book, Last Boat Out of Shanghai, by Rachel Myrow on San Francisco’s KQED radio program. Listen on the KQED website. An interview with Helen Zia about her new book, Last Boat Out of Shanghai, by Thuy Vu on San Francisco’s KQED television program. Watch the interview here. “Last Boat Out of Shanghai” is so good I’ll certainly need to add it the syllabus for my class. That means something else will have to go—or my students will simply have 400 more pages of fascinating reading. –Mr. Wasserstrom is the co-author of “China in the 21st Century: What Everyone Needs to Know,” an updated third edition of which was published last year. As the child of two refugees, Helen Zia can speak to the effects of displacement, separation, and the personal costs of survival, adaptation, and reinvention. As an advocate for Asian-American and other minority communities, for women’s rights, and for LGBT rights, Zia turns inward in her newest book…. Gathered, analyzed, and distilled with insight and meticulous documentation, Zia’s book gives voice to a history almost lost. In this enthralling, heartfelt narrative, journalist Zia (Asian American Dreams) tells the stories of four people during the 1949 mass exodus from Shanghai following China’s Communist takeover…. Vivid and well-researched, Zia’s engrossing work brings this tumultuous period to life. Stories of courage and resilience emerge from decades of oppression. On May 25, 1949, the People’s Liberation Army marched into Shanghai, completing Mao’s victorious takeover of China. Coinciding with the 70th anniversary of that revolution, Chinese-American journalist Zia (Asian American Dreams: The Emergence of an American People, 2000, etc. ), former executive editor of Ms. magazine, vividly chronicles the lives of several individuals caught in the violent “tsunami of revolution” in China’s “biggest, most glamorous, and most notorious city,” the port where throngs of Chinese rushed to escape…..
An absorbing history of a refugee crisis that mirrors current events. I have long been an admirer of Helen Zia’s writing and scholarship, but Last Boat Out of Shanghai is at a whole new level. It’s a true page-turner. Zia has proven once again that history is something that happens to real people. I stayed up late reading night after night, because I wanted to know what would happen to Benny, Ho, Bing, Annuo, and their friends and families, when an action that on the surface looks good one can send you down a disastrous path, while sometimes a mistake can bring triumph. These are choices that refugees around the world continue to make, which makes helps to make this book relevant in addition to being such a compelling good read. Helen Zia’s new book, Last Boat out of Shanghai is a true tale of wartime savagery and difficult moral choices. Rich in sweep and detail, this compelling saga is a Chinese Dr. Zhivago. Enjoy a great historical read; take the Last Boat out of Shanghai. Gripping, magisterial, ambitious, and intimate, Last Boat Out of Shanghai not only depicts a cataclysmic century as it was lived and felt by four very different people, it keeps you on the edge of your seat the whole way. What a tour de force! I could not put it down. Last Boat Out of Shanghai is an impeccably researched and beautifully crafted account of the dramatic events surrounding the Communist takeover of China’s largest and most cosmopolitan city. Tracing the fate of four fascinating families, Helen Zia offers a warmly human perspective on one of the most wrenching political transitions of the twentieth century. This book is a genuine pleasure to read, with much to inform and interest the general public and China specialists alike. Much has been written by and about the diaspora from war-ravaged Europe during World War II to make new lives for themselves far from home, but accounts of those who fled China’s postwar turbulence are rare. Helen Zia remedies this lack in a book that makes the experience of those who fled Asia’s most vibrant city both accessible and emotionally compelling. Last Boat Out of Shanghai deftly weaves together the stories of Chinese displaced by political turmoil into a mosaic that celebrates human determination, resilience and ingenuity. In Last Boat out of Shanghai, Helen Zia provides the wide lens of history and an intimate focus on four young individuals facing the personal torment of leaving China, as well as family members. Meticulously researched with a scholar’s acumen, the pages unfold with the harrowing suspense of a novel. Zia’s portraits are compassionate and heartbreaking, and they are, ultimately, the universal story of many families who leave their homeland as refugees and find less than welcoming circumstances on the other side. I read with a personal hunger to know the political and personal exigencies that led to those “now or never” decisions, for they mirror the story of my own mother, who left on virtually the last boat out of Shanghai. War, foreign occupation, revolution, counter-revolution, exile, and new lives: the worst and best of times of a remarkable population from China. Helen Zia tells their stories with clarity, understanding and empathy. Unforgettable and moving! I am so thankful to everyone who has taken the time to read my book and offer their critiques. More reviews on the way, please check back!